We’ve already covered many of the advantages powder coating has over liquid paint: how it can cost you significantly less and is more durable all while being a cleaner and safer process. This time we will discuss when manufacturers are outsourcing their finishing to a job shop and are deciding whether or not to bring their powder coating in-house. Adding a powder coating line can help increase quality and reduce cost. (Photo courtesy of Espo’s Powder Coating in New York. Reliant equipment shown). Every manufacturer I’ve worked with told me that improved quality was the number one reason for bringing their finishing in-house. This isn’t to say all job shops have poor quality, but they may not have the tight specifications that the manufacturer would like. Irregular thickness, adhesion problems, surface defects, gloss, color mismatch, and damage are all characteristics of outsourced coatings, and all of them create costly delays. For many manufacturers, adding an in-house line was easily worth the investment to control the defects from their outsourced partners . As an example of typical powder coating costs, I looked at a large chain automotive parts retailer. To buy an uncoated wheel rim it costs roughly $50. 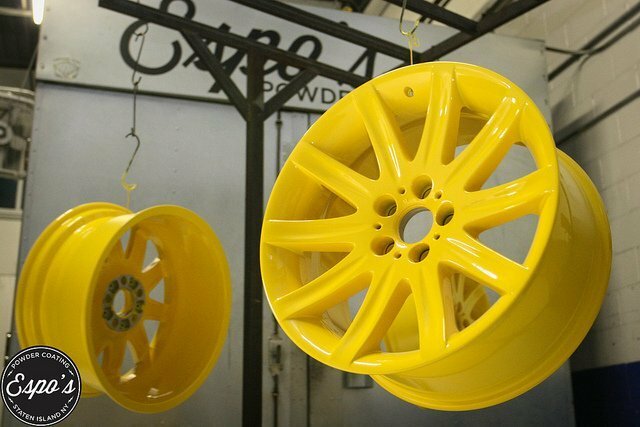 For this same wheel rim, it costs $100 for a single color powder coat. For an exotic two-coat color (such as Hyper Silver) the wheel rim can reach $450. Granted the last wheel is far more stylized and the finish must be perfect, but the mark-up involved can be substantial. In the above example, if brought in-house, the materials cost for doing a set of 4 wheel rims would be about 1 pound of powder. Say $7.50 a pound for a normal color. Pretreatment chemicals would cost about $0.50 per gallon of water. You would use approximately 2.5 gallons of water to clean 4 wheel rims, so $1.25 for chemicals. Well-insulated ovens have a gas/power cost of about $5-8 an hour, so let’s say $6.50 an hour. It only takes ½ an hour to cure the 4 rims, so energy cost of $3.25. Labor would be approximately $20 an hour and you could cycle 4 rims every 30 minutes, so $10 labor in 4 rims cost. The total part cost for finishing in-house would be $7.50(powder) + $1.25(pretreat) + $3.25(oven) + $10 (labor) = $22 for 4 rims or $5.50 cost per rim. This is a rough estimate and doesn’t include all costs but if the wheel manufacturer was having their wheels painted somewhere else, the $50 cost versus $5.50 cost is significant. This example also only factors for a small batch of 4 rims; with a larger coating production run, the in-house cost goes down even further. Manufacturers know their cost of outsourcing by how much they pay per part. But there are other costs besides raw production to consider. Shipping the part back and forth, packaging the part, inventory costs of parts coated and waiting to be coated, delay of available parts costs, and damage to parts are all factors when comparing outsourced to in-house coating. Often times manufacturers need a small parts run fairly fast to avoid costly delays. Whether you’re replacing something that may have been fabricated wrong, or a slip up on a pick list that they didn’t have the correct inventory, being able to fix these issues prior to shipping is valuable. Having the powder coating in-house allows for quick turn-around for these and other unforeseen issues. As we’ve already discussed, since powder coated items can be finished, cured and packed quickly, having the ability to coat in-house can save days of delay. Having your coating in-house is also instrumental for the research and development of new colors or new fabricating designs that you would rather keep private. This finishing flexibility allows for the experimentation with new technologies and improved quality processes that can give companies a competitive advantage. When deciding whether to install a new powder coating system in your operation, the real challenge is comparing all your costs to see if the benefits are worth the investment, labor and learning curve of developing a good finish process. Training and flexibility are very important when starting a new finishing process, as is setting realistic goals or expectations (though we can certainly help you get up to speed with your new equipment). Remember to keep a good relationship with your job shop vendor, since you may need them in the interim and if your finishing capacity gets maxed out. Ultimately, if you are only coating a few things a year and don’t anticipate adding powder coating to your process, outsourcing can be a very effective way to handle your coating needs. However, if you’re already outsourcing a sizable amount of work every month and are concerned about cost, quality or delivery deadlines – or all three – it’s time to consider bringing you powder coating in-house. Looking for additional information to help your purchasing and powder coating operation? Please check our Resources page. This entry was posted in News on July 7, 2015 by Bruce Chirrey.